Israeli soldiers abducted, on Monday at dawn, fifteen Palestinians from their homes, after breaking into them, and violently searching them, in several parts of the occupied West Bank, the Palestinian Prisoners’ Society (PPS) has reported. The PPS office in Bethlehem said the soldiers abducted eight Palestinians, from several parts of the governorate. They have been identified as Mohammad Khaled Ta’amra, Majed al-Azza, Abdul-Razeq Badawna, Ahmad Khaled Asakra, Faisal Yousef Sha’er, Mohammad Khal Tannouh, Mohammad Adeeb Mousa, and Qaher Jamil Abu Kamel. The soldiers also invaded homes in Qalqilia, in northern West Bank, and abducted three Palestinians, identified as Kamel Mohammad Adwan, 19, Luay Odah, 16, and Ali Moayyad Shreim, 18. In Jericho, the soldiers abducted Mohammad Khaled Batanja and Tamer Majed Barahma, from their homes. 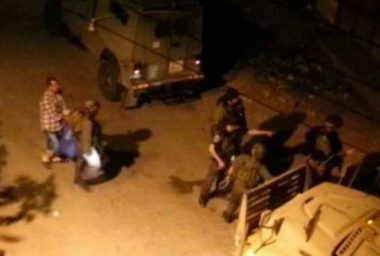 In addition, the soldiers invaded and searched many homes Nablus, in northern West Bank, and abducted Moath Reehan. Another Palestinian, identified as Mohammad Abdul-Rauf Mahmoud, was abducted from his home, in occupied Jerusalem.